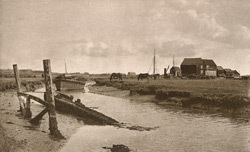 In the descriptive letterpress which accompanies 'A Tidal River,' Graham Balfour is reluctant to comment on J B B Wellington's study of Walberswick because he "has no personal knowledge" of the area. He prefers to "leave it to those who really know this coast to say whether the artist has not completely caught the spirit of the place in this picture." "It is a somewhat embarrassing and delicate task to put into words the methods and ideas of an artist who is wisely enamoured of silence. Mr. Wellington has never published anything beyond formulae and one or two purely technical papers; he is not fond of writing, and does not believe at all in writing about Art...It is not easy for the man who does the talking to secure much belief in the sincerity of his declaration, that pictures and not arguments or explanations are the only means likely to secure the recognition of photography as an art, or to set it on the right path."